loved the beach shuttle. desk staff was amazing and helpful. We liked the facilities such as pool and restaurant. Everything was close to perfect. Great bedroom size and comfortable beds! Cleaning service was provided efficiently daily. Everything worked well and the pool area was great! We had three in our party and the family room was great for us. Two queen beds and a single bed with two bathrooms. The rooms were large and having two separate air conditioners was great, as one person liked it cold and the other, just cool at night. 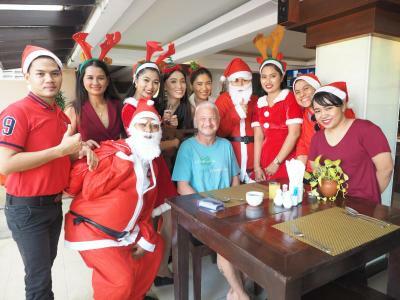 The staff at the front desk were nice and the staff at the restaurant were very friendly. Nice pool area. Staff was great! Especially the staff at the restaurant in the evening, so delightful! Location was also good. We were upgraded rooms on arrival (due to it being low season). Bed was comfy, lots of pillows. Breakfast was not included with what we booked but was included for others however there was a great German breakfast place near by. Room had snacks for purchase at reasonable prices and free water. Location was great, staff was super friendly, food was awesome, room was big and clean, amenities were great, just 2 Kms from Bangla Street. The terrace caught the sun and the hotel itself was very quiet and peaceful with a really nice pool area. 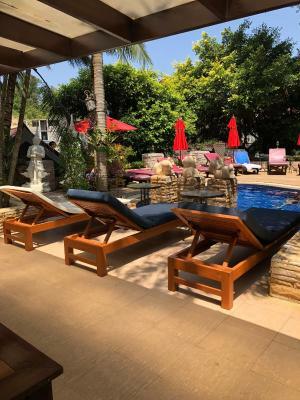 Club Bamboo Boutique Resort & Spa This rating is a reflection of how the property compares to the industry standard when it comes to price, facilities and services available. It's based on a self-evaluation by the property. Use this rating to help choose your stay! 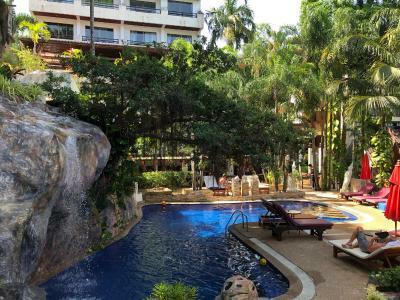 Club Bamboo Resort is a 15-minute walk from Patong Beach and Jungceylon Shopping Mall. It offers boutique-style accommodations with free WiFi and an outdoor pool. Guests can indulge in treatments at the spa. 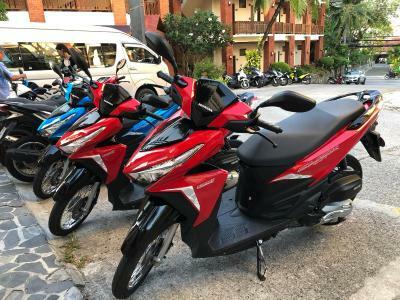 Club Bamboo Boutique Resort & Spa offers free round-trip shuttle service to Patong Beach. Bangla Road and Jungceylon Mall are within 0.9 mi of the resort. Enjoying beautiful views of Patong Bay, rooms at Club Bamboo feature wooden furnishings and Thai artwork. 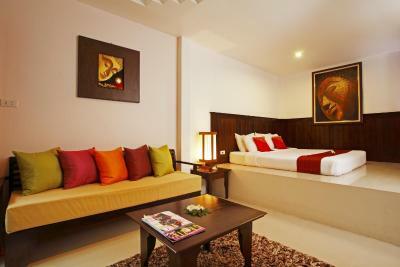 Each air-conditioned room comes with a marble bathroom, satellite TV and mini-bar. Guests may exercise at the fitness center or cool off with a refreshing swim in the pool. In-room massage services can be enjoyed in the privacy of the guestrooms. Day trips and travel arrangements can be done at the tour desk. The Hidden Oasis Restaurant serves a selection of Thai and European dishes. During the daily Happy Hour, cocktails, beer and wine are available at special prices. Room service can be arranged upon request. When would you like to stay at Club Bamboo Boutique Resort & Spa? Spacious room features dark wood interior and a private balcony. On the third floor of the main building, these Thai-style rooms are fitted with marble floors and Baroque-style furniture. Please note that this room type has no capacity to accommodate an extra bed. 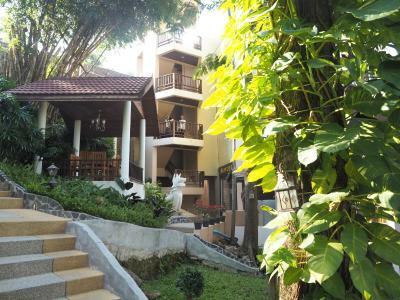 Penthouse Suite is on the top-level floor and has a beautiful view of Patong and Patong Bay. It is decorated with Thai decor and has a kitchenette, spacious living area and a large marble bathroom with a king spa tub. This villa has a sofa, mini-bar and dining area. Spacious room features a private balcony and pool views. House Rules Club Bamboo Boutique Resort & Spa takes special requests – add in the next step! Club Bamboo Boutique Resort &amp; Spa accepts these cards and reserves the right to temporarily hold an amount prior to arrival. Club Bamboo Boutique Resort & Spa accepts these cards and reserves the right to temporarily hold an amount prior to arrival. Schedule of shuttle bus service to the beach is as follows: 12 pm, 4 pm and 7 pm. Please note that guests will be charged in full for checking out prior to the departure date confirmed at check-in. The name of the credit card holder must be the same as the guest's name and credit card must be presented to the hotel upon check-in. In case of early departure, the hotel reserves the right to charge the total amount of the reservation. in all the country the communication is very poor it needs improvement. Great space in the penthouse suit. Bath is amazing! The shower was scalding hot and not possible to cool it down as all you got then was no pressure, no flow and it would constantly snap off shower mode and run into bath mode of the dual tap. The room was comfortable and a good view over the pool area. The Photos did not match the actual property. I was promised a room with a view. My view were the electrical cables. Very disappointing. The gym equipment were old and rusty with a view of a dirty dam. I asked to move rooms and my request was declined. We ended up looking for alternative accommodation. Great location. Friendly and helpful staff. Big rooms. Arrived to not clean room, so the agreed to changed the room. It was disappointing to arrive to unclean room, but the stuff are really nice and they made sure I am happy with the other room. I stayed there for 2 nights and it was very nice. The pool is good. There is a gym but the space there is not comfortable because it was too hot to exercise. I asked one girl if she's working there--she told me yes and I asked to turn on the air conditioner but it didn't work that much. The breakfast is tasty. After one night the stuff cleaned my room well and she was nice. staff who came out from the office she spoke to me very toot but the lady at the reception very helpful and very nice. We did not like the receptionist manner, behaviour. She was annoyed while i was asking some questions. It seemed kind of rude. And she had to be more patient.